All downloads are Adobe PDF and print on standard 8.5 x 11 paper. They open to a new window and may take a bit of time to open depending on your internet speed. For personal use only. All copyright information must be left intact. 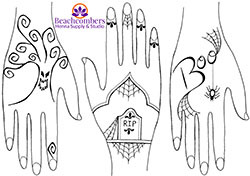 These are free henna designs from Jody for your use. They cannot be resold, but feel free to use them in your festival books! January 2019: Starting off the New Year with our free henna design eBook from 2018! February 2019: Have some Valentine's fun with your sweetheart! These garters can also be worn as arm bands, bracelets, or anklets! March 2019: Note that all three henna hands use the exact same layout! The details and negative space are used differently to create vastly different looks. It's that time of the year...election time. 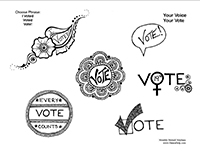 Enjoy these free "Vote," "I Voted," and "Vote Today" designs. I know you are getting requests for Pokemon henna so I thought I'd hennafy some Pokemon characters. 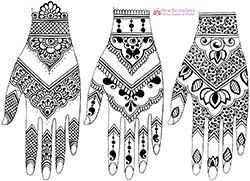 Use these alone or add to your regular henna designs. 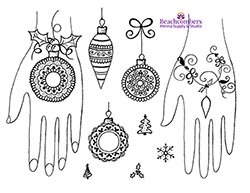 Holiday decorations, winter motifs, and party favors are great themes for December and January henna. 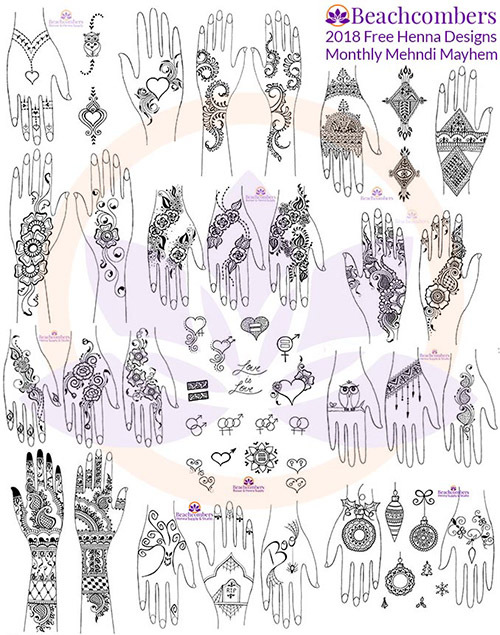 This free eBook contains the 2018 MMM free henna designs in one easy download. 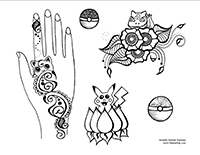 This free eBook contains the 2017 MMM free henna designs in one easy download. 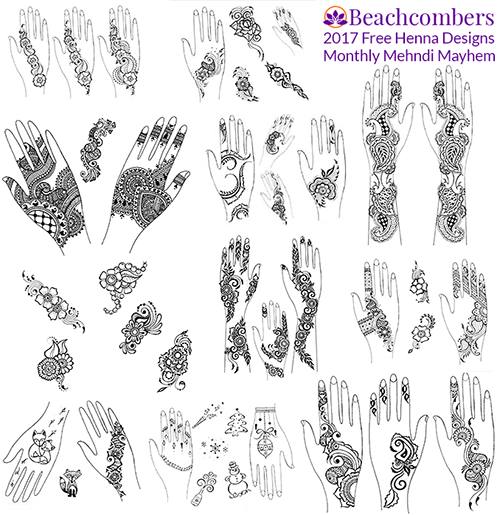 This free eBook contains the 2016 MMM free henna designs in one easy download. 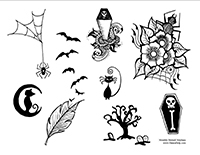 We offer low-cost Henna Design eBooks! 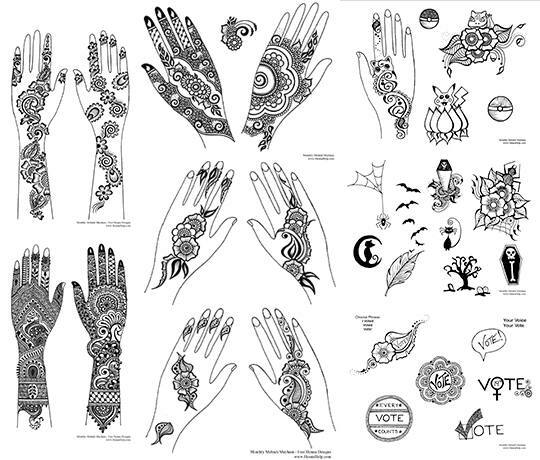 These design templates are for you to practice henna or to draw out your own henna designs for your festival books. This may take some time to load as it's a fairly big file. 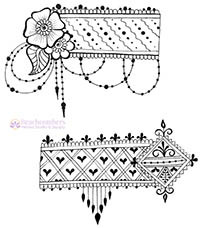 This free eBook contains multiple pages of blank henna hand templates and some box and shape templates. This single page download is simply two blank hand templates. The nice thin fingers mean you won't add more detail on the template than you can do in real life! These are different shaped leaves that are great for practicing henna fillers. This is an entire page of blank squares that can be used to practice fillers, basic element combos, or to practice keeping $5 designs in size-check. The most common henna question I get is answered, in detail, in this helpful download! Printing mixing instructions lets you write your own personal notes while you mix. Keep these for the next time you mix henna for an instant reminder of your last mix! The basics of using henna on the hair with a simple recipe and plenty of tips to make hair henna easy. 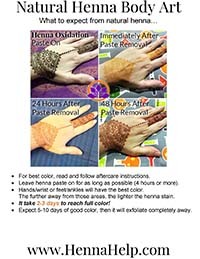 Step-by-step instructions for straining henna paste to get super smooth, clump-free henna. Basic cone rolling instructions and how to fold henna cones. A short list of helpful hints to make your event go smoothly. Set of four henna aftercare instructions on each page. These are for you to give to your clients/friends when you henna them. The signs below are designed to be printed on standard 8.5 x 11 paper, but will fit an 8 x 10 frame, as well. Use these at events to help answer questions. Put them in frames or place them in your design books. Print this sign in color and you can show your customers the life span of henna color. There is a blank space on the sign to list your henna ingredients. In addition to giving clients take-home aftercare instructions, place this sign in a prominent space so other waiting for henna can see it. All downloads are Adobe PDF and print on standard 8.5 x 11 paper. They open to a new window and may take a bit of time to open depending on your internet speed. For personal use only. All copyright information must be left intact. Feel free to use these for yourself or to share with others, but all copyright information must be left intact. You may print these out for yourself or for others, but you may not resale or trade these in any way. You may link to these free downloads, but they are not to be hosted on any other site. Copyright © 2010-2018 by ShopBeachcombers.com Inc. All Rights Reserved Worldwide under the international Berne Convention and the US Copyright Act of 1976.